The Digital Aesthetic³ conference in Preston proposed to explore the impact of digital on our lives. For our correspondent, it was the notion of digital failure, rather than success, that proved most intriguing. Friday 5 October, 7.30 am: I am woken by the tinny and repetitive tune which heralds the beginning of my day. Reaching over to silence the persistent iPhone, I decide to check the departure time of my train and, through a well-rehearsed choreography of thumbs, navigate my way through the train company’s website. Less than an hour later, I am at the railway station, tapping upon another, larger screen with my index finger and purchasing tickets with a credit card. On the platform, other passengers are ‘plugged-in’ to various digital devices: loudly conversing with people in remote locations; disseminating soundbites via Facebook or Twitter; reading digital books; or tapping their feet to a rhythm which they alone can hear. Within the context of these everyday and unremarkable forms of digital engagement, the premise of Digital Aesthetic³ – a two-day conference and digital art exhibition, run jointly by the Harris Museum & Art Gallery and the University of Central Lancashire, and my destination last Friday ­– seems slightly outdated and strange. The publicity material stated that the event would explore ‘the impact that the digital has on our sense of self and our relationship to the physical world’, and that the audience would be encouraged ‘to think about how their own perception of reality is shaped by their relationship to the digital’. Yet, the binary distinction between the digital/virtual and the physical/real implicit within this statement is at odds with the embodied and physical ways in which we interact with digital technologies. Surveying my fellow passengers, it seemed that, rather than impacting upon our relationship to the ‘physical world’, the digital has become part of it. As the anthropologist Amber Case puts it, “We are all cyborgs now”. The question I brought to the conference, therefore, was not concerned with the relationship between the digital and the physical, but instead surrounded the role of artists within our contemporary networked society. Fortunately, over the two days, this was addressed in a number of distinct and surprising ways. Furthermore, rather than the physical/digital dichotomy, it was the changing relationship between art and digital technology, and the associated issues of dissemination, display and institutional recognition, that emerged as key themes of the conference. Beryl Graham, Professor of New Media Art at the University of Sunderland, spoke about the complexities involved in collecting, archiving and critically framing new media art. She highlighted how cultural institutions and funding bodies often confuse digital art with the use of new technologies for education and audience development, and called for the establishment of a critical aesthetics of new media art practice. Similarly, Lindsay Taylor, Exhibitions Officer at the Harris Museum, discussed the practical and political implications of collecting digital art. Central to this was the question of how institutions can justify the use of public money to purchase digital artworks which, due to their nature, are neither unique nor particularly ‘ownable’. For me, however, the most interesting aspect of the event was what Maria Chatzichristodoulou (aka Maria X) – a cultural practitioner from the University of Hull – described as “a glitch ontology” or “an aesthetics of failure”. According to Maria, while new media discourses, including those advanced by cultural organisations, continue to be bound up with romantic and utopian notions of unbridled sociability, cooperation and collaboration, the reality for most people is often very different. Indeed, throughout the event there was a sense that, despite its prominent role, digital technology was not necessarily on our side. Like most conferences, the use of audio and video caused problems within presentations, and, minutes into the exhibition opening at the Harris, a DVD player overheated. 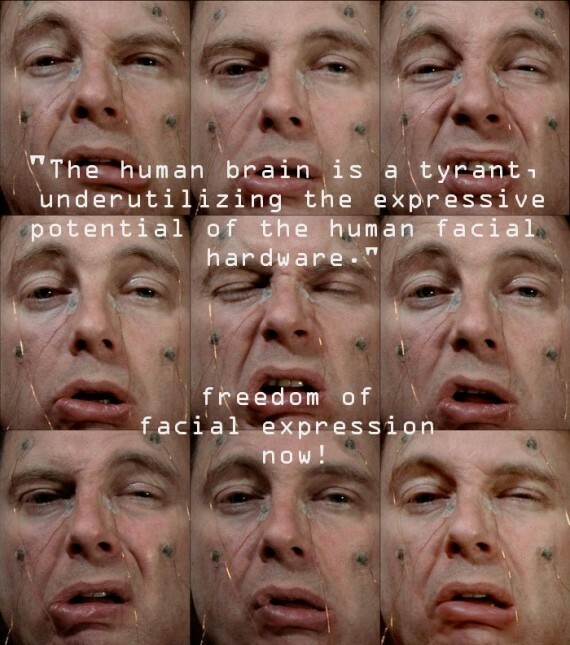 Most disruptively, however, Arthur Elsenaar’s wonderful and hilarious performance, in which a computer externally controls his facial muscles, had to be rescheduled when the computer in question refused to play along. Far from an inconvenience, however, such embodied, frustrating and universal encounters with technology were depicted as a type of digital aesthetic. Both Maria X and Ruth Catlow – co-founder of the Furtherfield organisation ­– discussed the work of Annie Abrahams, an artist who strips social media of its cosy interfaces to reveal the futility of communication and the impossibility of shared experience. Similarly, Marilene Oliver’s presentation of her haunting figurative sculptures, produced using body-scanning technologies, exposed the continued fragility and mortality of the human body, despite technological advances. Unlike artworks, such as those presented by Terry Flaxton and Peter Campus, which conceal their digital processes beneath seductive visual experiences, these practices reject the pursuit of perfection in favour of ‘messing around’. By advancing an aesthetics of failure, they reveal what Catlow described as “the dark goo” which pervades our relationships with technology and with one another. In so doing, they release us from the promise of true communion and force us to take responsibility for our own cyborgian futures. The Digital Aesthetic³ exhibition is at Harris Museum & Art Gallery until 5 January.